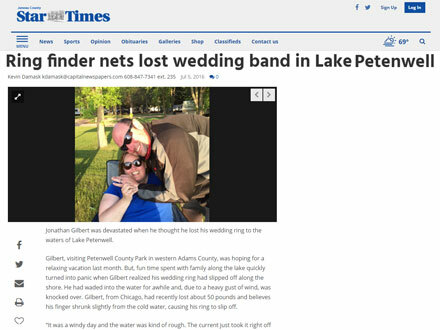 We were honored to be featured in a newspaper article detailing a Lost Wedding Ring in Lake Petenwell, WI. Kevin Damask from the Juneau County Star Times newspaper walks through the events of John’s lost wedding ring in Lake Petenwell, how he found www.LostandFoundRing.com and how we were able to locate and return his lost ring with a metal detector. Please also make sure to read the original blog story of John’s ring, including the story as told by John. This was a unique hunt that took 10 times longer to get to, than the actual hunt took! Lake Petenwell was over a 2 hour drive from my home, but I could just tell after talking with John that we would be able to find it. So, I jumped in the car, picked up my dad for company on the road trip and headed to Lake Petenwell with our metal detectors. Once we arrived, the sun had started to go down and I knew that we needed to start the hunt right away. John walked us through how and where he had lost his wedding ring. I set up a grid in the water using PVC pipes, which is helpful to define the search area and to ensure that nothing is missed when scanning with a metal detector. 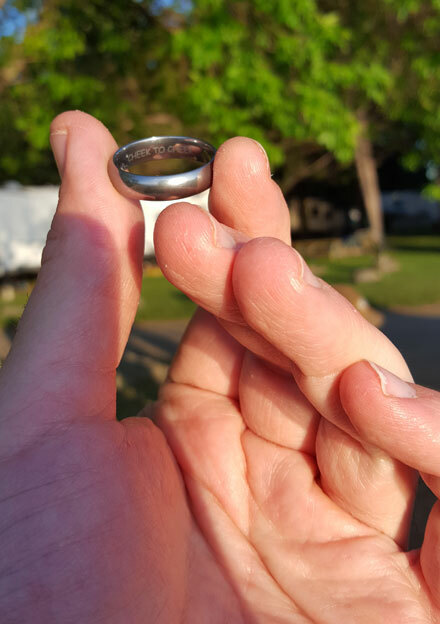 After less than 30 mins of searching, a nice signal was registered on the metal detector and I just knew we had found John’s ring. 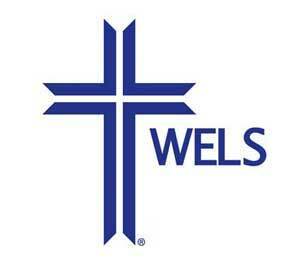 Check out the newspaper article and the original blog post to read the entire story.